Wrinkles appear because of inevitable aging process yet sun exposure, dehydration, pollution, stress and improper skin care can also give you those nasty lines at a younger age. When the collagen connecting the skin tissues gets damaged, the elasticity weakens forming fine lines and deep furrows. Don’t worry; there are many ways to combat the issue. Though preventing aging process is not possible, we can at least slow down both aging and appearance of wrinkles with “Lemon”. Is Lemon Good For Wrinkles? Vitamin C present in lemon encourages the collagen production which helps to maintain the skin elasticity. It tightens the loose and open pores. The acidity of the lemons lightens the skin and reduces fine lines. It hydrates and returns lost moisture of the skin. Lemon repairs the damage caused by sun exposure and pollution. 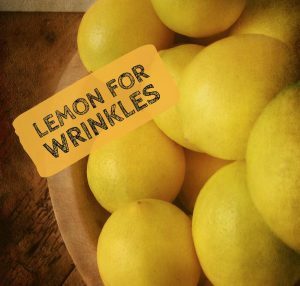 How to Use Lemons for Wrinkles? Slice a lemon and massage into wrinkles for few minutes. Let it rest for 10 minutes and rinse off with water. Alternatively, you can add grated lemon peel. Combine juice of 1 lemon, 1 cup each of water and cucumber juice. Freeze the solution in an ice cube try. Massage the ice cube for few minutes. Store the remaining for future use. This process is efficient for wrinkles around your eye brow and eye bone. Mix 1 tablespoon lemon juice and 1 teaspoon olive oil. Apply the solution around the eyes and forehead. Let it rest for 10 minutes and rinse off with cold water. Note: Make sure the liquid doesn’t drip into your eyes. Alternatively, you can use almond oil instead of olive oil. The humectant present in honey preserves moisture in the cells and boosts collagen production. Combine 1 tablespoon honey and 1/2 teaspoon honey. Apply the mixture on face and neck. After 10 minutes, rinse off with cool water. Egg white shrinks open pores and reduces excess oil secretion. Whisk 1 egg white with 1 teaspoon lemon juice. After 15 minutes, rinse off with lukewarm water. Pat dry and apply any moisturizer of your choice. Blend 1 tablespoon of lemon juice, 1 egg white, 1/2 cucumber and 5 mint leaves. Apply the solution on face and neck. After 20 minutes, rinse off with lukewarm water. Sugar removes accumulated dead skin cells and encourages production of new cells. Mix 2 tablespoons lemon juice and 1 tablespoon sugar. Gently massage the mixture on wrinkles for few minutes. Leave it on for 15 minutes and rinse off with lukewarm water. Grate 1 inch ginger root and add it to a cup of hot water. Allow it to steep for 15 minutes. Strain and add lemon and honey to it. Combine enough amounts of lemon juice and Indian gooseberry powder. Apply the paste on face and neck. After 20 minutes and rinse it off with water. Mix 1 teaspoon each of lemon and yogurt. Apply the mixture on wrinkles and leave it for 30 minutes. De seed and puree 2 apricots. Add 1 teaspoon cold milk and juice of 1 lemon to apricot puree. Apply the mixture on wrinkles and leave it for 10 minutes. Mix 5 tablespoons of lemon juice, 1 tablespoon each of glycerine and rose water. Spray the mixture nightly before going to bed and wash next morning. Refrigerate the remaining solution for future use. The natural astringent properties of lemon balm keep your skin tight and firm. Add a handful of lemon balm leaves in 2 cups of hot water. Allow it to steep for 20 minutes, strain and let the water cool down. Use this solution to rinse your face daily morning. Mix a few drops of lemon grass essential oil with jojoba oil. Massage the oil on wrinkles daily. This process is good for wrinkles under the eyes. Mix 2 drops of lemon oil in 1 teaspoon of vitamin E oil and 1 tablespoon of almond oil. Apply a thin layer of the mixture under the eyes and massage for a minute to let the skin absorb it. Repeat nightly before going to bed. Lemon juice makes skin photo sensitive, so avoid sunlight at least for 6 hours. If your skin experiences dryness after lemon application, massage a thin layer of coconut oil or olive oil. Don’t apply lemon on cuts, bruises or wounds. It is good to try above methods before going to bed as skin undergoes recovery cycle every night. Avoid using bottled or store brought lemon juice as they can preservatives. Avoid lemon if you are allergic to citric acid. If you have a sensitive skin, dilute lemon juice with water. Keep hydrated and have a nutritional diet. Apply sun-block and protective clothing before going out in the sun. Try certain yoga postures that help to decrease wrinkles. Did you find this article helpful? Write us your feedback, suggestions or queries in the comments section below. i would like you to send me more remedies on how to get rid of wrinkles please.